Wanted: Lots of Classroom Leaders! I know that most of us have a set of classroom jobs in place, but does every child in your classroom have a job? It was honestly something I hadn't thought much about until we started our Leader in Me training three years ago. And I wasn't doing a very good job of rotating responsibilities either. Assignments were "hairy scary" and my kids were not invested in their jobs at all. After our LIM training began, I recognized that every child in my classroom should be a leader and it should be a job they want to have. They should also have the opportunity to try out different leadership roles throughout the year, which meant we would need to change them on a regular basis. Click to check me out! Every child would fill out a job application. We would MODEL the first one in class to make sure our expectations were clear, and then give them time to complete their first application in class. We made sure they gave us 3 choices so we could try to give them something they wanted to do. If we had to give a child a job that wasn't on their list, we made a note of it. That child would be sure to get a job of their choice the next time. We kept all of our job stuff in a folder and made a running list of kids we needed to keep up with. The kids would get new jobs once a month. This gave them time to develop new skills and feel confident about their role in our classroom. Our students would also keep a running list of all of the jobs they held throughout the year in their Leadership Notebook. They would refer to this when they were applying for a new job so that they made sure to try new things throughout the school year. It also became a great talking point at parent-teacher conferences. We kept a display board up in the room that was easy to change around from month to month. Wall space is precious, so I used the back of a bookcase! 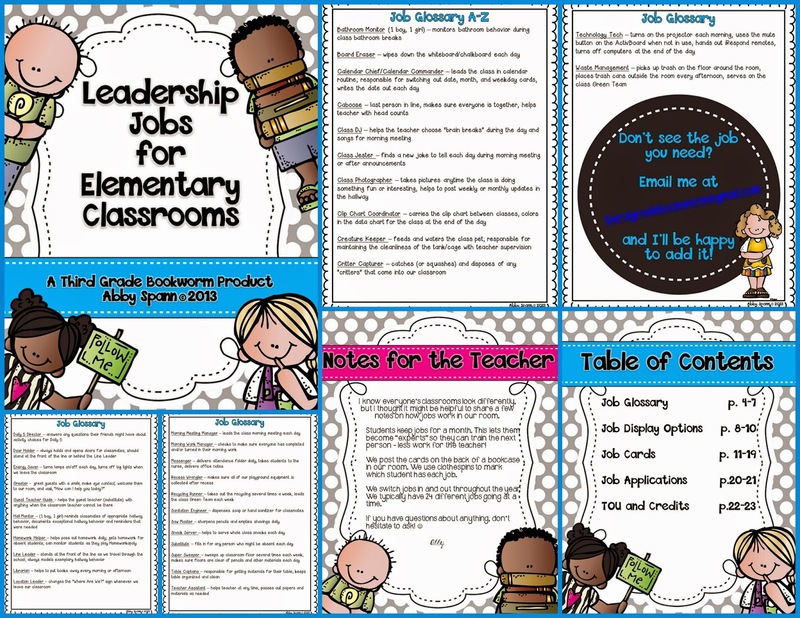 I've had lots of great feedback on my leadership jobs packets lately, and I've added several new color schemes to the mix. :) The backgrounds are easy for me to swap out, so if you have a particular color, print, or pattern in mind to match your room, let me know and I can add a listing for you! The purple dots packet is brand new today! I just added the year-long tracking sheets to all of the packets, so if you've already purchased this make sure you go back and get the new goodies! It's good to teach leadership to kids at an early age. They will be able to nurture their knowledge and skills by taking on responsibilities. Thanks for the idea! A *Berry* Cute Back-to-School Freebie!